Leer de ins en outs van 's werelds meest gevierde bruisende witte wijn tijdens deze VIP-dagtour door het champagneland. Ga achter de schermen van een benedictijnenabdij, waar Dom Perignon de vroege productiemethoden bewandelde en ontdekte hoe champagne synoniem werd voor feestvieren in een door een familie gerunde wijnmakerij. Tours zijn inclusief ontbijt, vrije tijd om lunch te nemen in de champagnehoofdstad van de wereld en een rondleiding door de beroemde kelders van Moët. This was the highlight of our trip! The group size of 12 was perfect, and we were transported every where in a luxury van. The mix of the boutique champagne house and the large champagne exporter Moet was a great mix. Hugo was a bunch of fun and he and the owner of the boutique champagne house taught us so much about champagne and history of the region. It was very relaxed and we were allowed to wander through the rows of grape vines picking and eating the grapes! The champagne was delicious, too. My adult daughter and I took this tour. Hugo was a wonderful and fun guide and made this day one we will remember as a favorite. He went the extra mile for us in every way. 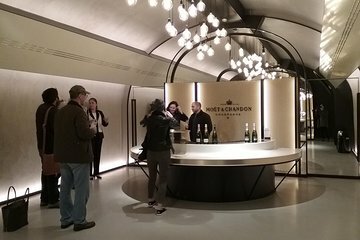 We learned so much and experienced a small champagne house as well as Moët. Highly recommended. I booked this trip to escape Paris for a day and it totally delivered. Transport was really easy and comfortable and the various stops were all fantastic. My favorite stop was the smaller winery where I got to see someone saber a bottle of champagne - definite trip highlight.